Today we offer the"Yoga Bhajan Formation" and " The Sacred Healing Circle" in Agentina, United States and Europe. One part gives, one part receives... Give the best of you and receive Mastery. On this website we'd like to share with you the history of Yoga Bhajan, photos from our yoga encounters, workshops, community services, our songs and more. With the Yoga Bhajan Set you will discover a new way to play: draw a card, practice the yoga posture shown on it, then look up the number of your card in the book and read the poem or story, answer the riddles, sing the song while you listen to it in the CD. There are also a ton of games you can play using the cards, which you'll find in the book under the section "Games to Play". 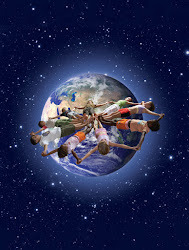 If you are a yoga teacher or you like to play with kids, we've provided material, ideas and suggestions for your classes. Yoga Bhajan was created from a place of much love. As quoted on the inside cover, this book "...is like the wings of a butterfly that open to take flight, engaging more intensely with the grace of Oneness."